Prof. P.-A. Crépeau (1926-2011), born in Gravelbourg, Saskatchewan, was Emeritus Wainwright Professor of Civil Law. 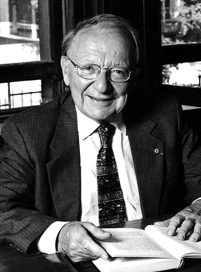 He obtained his Licence in Philosophy at the University of Ottawa (1947), a B.C.L. at the Université de Montréal (1950), a Bachelor's of Civil Law at Oxford (1952) and a Doctorate at the Université de Paris (1955). He began his career as an assistant professor at the Université de Montréal Faculty of Law (1955-1959), and soon after joined the McGill University Faculty of Law (1959-1994). Professor Crépeau passed away on Wednesday, July 6, 2011, at the age of 85. He dedicated his professional life to studying and developing Canadian civil law from a comparative law perspective as well as to promoting the French-inspired civilian tradition, in Canada as well as internationally. In 1965, Professor Crépeau was entrusted by the Québec government to reform the Civil Code. As the president of the Civil Code Revision Office, he aspired to create a work that would serve as a “collective reflection on the very foundations of private law institutions”. In 1978, this work culminated as a presentation to the National Assembly of the Draft Code Civil, accompanied by explanatory Commentaries. It served as the framework for the governmental project which eventually became the new Civil Code of Québec, adopted in 1991 and came into force on 1 January 1994. In 1971, together with Professor Frank R. Scott, Professor Crépeau prepared the Rapport sur un projet de loi concernant les droits et libertés de la personne, which influenced the Legislator in drafting the Charter of Human Rights and Freedoms in 1975. Holder of the Arnold Wainwright Chair in Civil Law and Director of the Institute of Comparative Law, in 1975 he founded the Quebec Research Centre of Private and Comparative Law at McGill University. At the Centre, he launched several research projects and publications, including Édition historique et critique du Code civil du Bas Canada/Historical and Critical Edition of the Civil Code of Lower Canada 1866-1993, Traité de droit civil and a Dictionnaire de droit privé et Lexiques bilingues/Private Law Dictionary and Bilingual Lexicons, destined to promote the development and growing influence of Canadian civil law. Professor Crépeau was a prolific author. La responsabilité civile du médecin et de l’établissement hospitalier (1956), Des régimes contractuel et délictuel de responsabilité civile en droit civil canadien (1962), Le contenu obligationnel d’un contrat (1965), L’intensité de l’obligation juridique (1989), L’affaire Daigle et la Cour suprême du Canada ou la méconnaissance de la tradition civiliste (1993), La fonction du droit des obligations (1998), La réforme du droit civil canadien : une certaine conception de la recodification, 1965-1977 (2003), as well as Pour un droit commun de la lésion entre majeurs (2007) figure among his more important contributions to doctrine. He delivered many presentations. Invited at a number of universities in Canada and abroad (Strasbourg, Vienna, Edinburgh, Baton Rouge and Vancouver, among others), Professor Crépeau participated assiduously in the endeavours of the International Academy of Comparative Law, where he served as president from 1990 until 1998, and is since then the honorary president. He was one of the founders of the Canadian Foundation of Human Rights, where he served as vice-president (1974-1980) and was a member of the Canadian delegation to the Hague Conference on Private International Law (1968 and 1976). Since 1986, he has been contributing to the work of the International Institute for the Unification of Private Law (UNIDROIT) in Rome, specifically to the elaboration of the Principles relating to International Commercial Contracts (1994, 2nd ed. 2004). Professor Crépeau was a Rhodes Scholar at Oxford (1950-1952) and has received the Prix Robert Dennery (1956) from the Law Faculty of Paris. Elected member of the Royal Society of Canada (1980), he was named officer, and later companion of the Order of Canada (1981, 1992), officer of the National Order of Quebec (2000), knight of the Ordre national du Mérite (France, 1984), as well as commander of the Ordre national des Arts et Lettres (France, 2004) and Advocatus emeritus of the Quebec Bar (2007). Among other honors, he has received the Governor General of Canada Ramon John Hnatyshyn Award for Law (1993), the Québec Léon-Gérin Prize (2002), as well as numerous honorary doctorates (University of Ottawa, Osgoode Hall Law School, Université Robert Schuman [Strasbourg], Dalhousie University, Université Panthéon-Assas [Paris II], Université de Montréal, Université Laval). In 2001, the Canadian Bar Association created the Paul-André Crépeau Medal, a prize that is awarded for contributions to the advancement of international aspects of private and commercial law in Canada. The University of Saskatchewan awarded him an honourary degree during its Fall 2008 Convocation ceremony. On November 19, 2008, the Government of Quebec awarded Professor Crépeau the Georges-Émile Lapalme prize in recognition of his remarkable contribution to the French language through Canadian law.